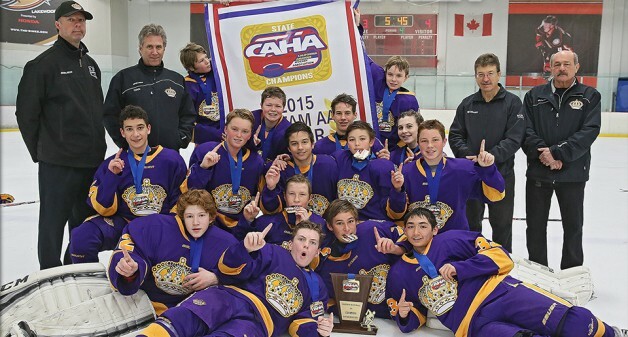 The Los Angeles Jr. Kings organization continues to stand front and center on the local AAA stage after capturing two California Amateur Hockey Association (CAHA) Tier I state championships this year at the 16U and Bantam Minor divisions. At states, which were contested last weekend the The Rinks-Lakewood Ice, both clubs knocked off the San Jose Jr. Sharks their respective best-of-three series. The Jr. Kings’ 16U Minor team, which forged a 4-2 mark against San Jose in CAHA regular-season play, bested the Jr. Sharks, 2 games to 1, in its series. Los Angeles opened states with a 4-3 victory over San Jose before the Jr. Sharks evened the series with a 5-2 triumph on Day 2. In the winner-take-all finale, the Igor Nikulin-led club doubled-up San Jose, 4-2. Stephen Cohen, an assistant coach on the team, along with Jaroslav Modry, is nothing but proud to be part of a tight-knit group of players that built on its chemistry throughout the season. “We overcame a lot of challenges, and the boys never lost sight of their goal of becoming state champions,” said Cohen. “What’s most impressive is that off the ice and away from the rink, they genuinely enjoyed each other and treated one another like family, and that translated into game situations; they were always set on sacrificing for the guy next to them. L.A.’s Bantam Minor club, which went 4-0-1 in the regular season against San Jose, swept the Jr. Sharks in their meeting at states. In Game 1, the Jr. Kings blanked San Jose, 3-0. They put the series to bed with a 4-3 overtime triumph the next day. With the core of the team intact the last 2-3 years, Shawn Pitcher, who coaches the club along with Jeff Turcotte, believes familiarity and smooth chemistry played a big role at states. “It was a great way to finish out the season, and I felt that the kids competed at a high level the entire weekend,” said Pitcher. “They’re a great group that just loves to play. And while it fell to the Anaheim Jr. Ducks, 2-1, in a tightly contested championship game, the Jr. Kings’ Bantam Major team, also led by Pitcher and Turcotte, still punched its ticket to the Pacific District Regional Tournament, which will be contested from March 5-8 at Sharks Ice-San Jose. “This is a gifted group, and as an organization we wish them the best of luck as it vies for a berth to the USA Hockey National Championships,” said Sorensen.